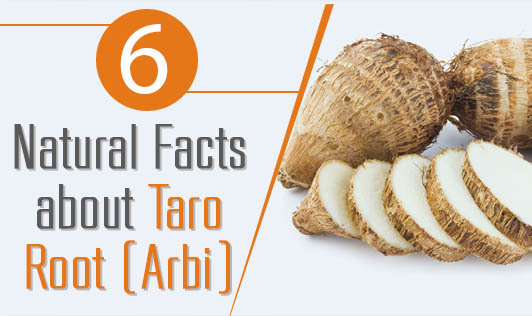 Arbi or Taro root is a vegetable native to Southeast Asia and South India. Taro root has a bland flavor but easily takes up the flavor of the seasoning when cooked. This starchy vegetable is often used in place of potatoes. It can be grilled, baked, boiled, and even fried. However, if you are planning on keeping it healthy, refrain from frying it. One serving of Taro root (around 2/3 cup) contains 80 calories. It is a pure source of energy. So if you’re trying to lose weight just take a small portion of it with lots of salads and a portion of protein to keep your meal balanced. Taro root is not a very good source of protein. One serving of this tuber has only 1g of protein. So you cannot eat Arbi as a complete meal. It is best when served as a side along with lentils (dal), rice, vegetables, or when added to chicken/mutton stews. Taro root gives 20g of carbohydrates per serving. If you are on a low-carb diet you can take just one serving of arbi for the entire day. Also, eating arbi before your workout is an excellent idea, as this high-carb root will provide enough energy for your workout. Just boil or roast it or mash it along with milk in a processor and have it as a milk shake. The milkshake is not only filling but also nutritious. Arbi contains 5% of your recommended daily allowance of Vitamin C. Vitamin C helps boost immunity and helps you fight off infections effectively. It is also a potent antioxidant and helps to flush out toxins from the system. Arbi contains some amount of vitamin A, which helps to produce the retina’s pigmentation and promotes growth of cell linings within the respiratory and digestive tract. Arbi contains small amounts of calcium, iron, and sodium. Iron helps maintain hemoglobin levels, calcium keeps the bones and teeth strong, whereas sodium helps maintain the body’s electrolyte balance. These minerals are in amounts lower than 5% of your daily recommended allowance. Eating arbi along with low-fat dairy products will considerably boost your calcium intake. However make sure to not eat the root raw. It is considered toxic when eaten uncooked due to the high levels of calcium oxalate. You can soak the root overnight prior to cooking to minimize the toxicity levels.